Driven by their new discoveries, the investigators launch into their second day of exploring the entombed Lake’s Camp. The expedition excitement has hit a feverish pitch and it is anyones guess what will be discovered next. Madness and disaster strike the Lexington Expedition. The gallant Starkweather mounts a rescue and finds an old, old argument waiting. 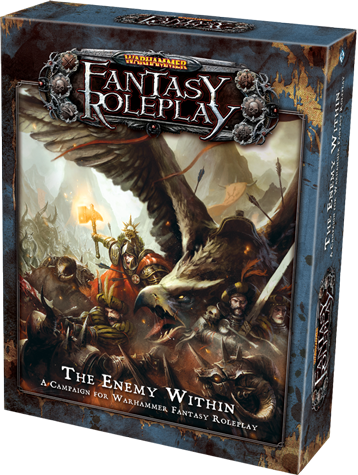 With The Enemy Within Campaign complete, the group does a round table discussion, dissecting the campaign, its strengths, weaknesses and much, much more. This is a SPOILER HEAVY episode for The Enemy Within, so please do not listen if you are playing the campaign and don’t want anything spoiled. With the trial of Wolfgang von Aschenbeck coming to a close and little time to prove his innocence, the party struggles to find any clues they can. Suspicions abound for possible enemies of The Empire but can anybody prove it? How do you tell a Witch Hunter to back off of a witch hunt? What happened to Emma? Is Aschenbeck being framed? Is Adelle all she is cracked up to be? Or is everyone just pawns in a grand conspiracy orchestrated by the Black Cowl? With a plan and a series of quests in place, the party sets out to locate the fate of Wolfgang von Ashenbeck, cleanse the Tainted Bell Clapper, and learn what they can from the Witch Hunter Adelle Ketzenblum. Emma recruits an army of waifs, a trial begins, and the party decides to cheat a bit when asked to follow some religious rules.